The workshop is targeted at 400 clinicians, clinical virologists and nurses working in the public sector who are currently involved in the treatment of patients with HIV and TB in KwaZulu-Natal, South Africa. This annual workshop attracts clinicians (nurses and doctors and pharmacists) from the private sector and public sector. 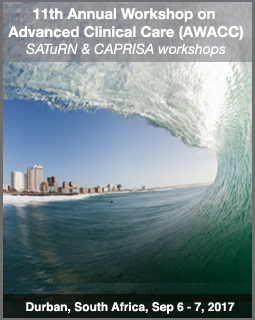 Krisp, the Southern African Treatment and Resistance Network (SATuRN) in partnership with CAPRISA ACC will present a full day programme on HIV & TB Drug Resistance and Clinical Management. Prof. Raj Gandhi Mass General Hospital (MGH), Harvard Medical School, U.S.A.
Prof. K. Ard	Harvard Medical School, U.S.A.
Prof. R. Goldstein	Harvard Medical School, U.S.A.
Dr. Richard Lessells	London School of Hygiene and Tropical Medicine, U.K.
Prof. S. Mukerji	Harvard Medical School, U.S.A.
Prof. R. Murphy	University of California Los Angeles, U.S.A.
Prof. M. Siedner	Harvard Medical School, U.S.A.
One of the main objectives of Krisp, AWACC SATuRN and CAPRISA is to support the NDoH and build capacity among clinicians to manage patients who still present in advanced HIV and TB clinical disease. In addition, we aim to build capacity as part of the CAPRISA ACC to manage patients who fail virologically and those who may need third line ART.